"a fictional blog you can help to shape, set in real time Manchester. Each week readers can vote on future plot direction, choosing between three possible developments in the story’s next chapter. The final instalment will be performed live at the Manchester Blog Awards on Wednesday 10th October." The project is part of the Manchester Literature Festival, which takes place from the 4th to the 14th of October, and is written by author Elizabeth Baines and produced by one of our favourite Manchester bloggers, Kate Feld (Manchizzle). 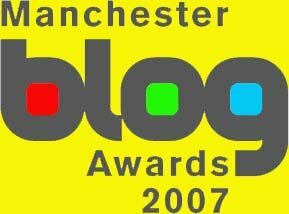 Speaking of Manchizzle… she’s recently posted the shortlist for this year’s Manchester Blog Awards which take place on the 10th of October. Some are familiar names from last year’s awards but many are new. I had a great time at last year’s awards – meeting bloggers, talking blogs over a few pints and doing some interviews for 5 Live’s Pods and Blogs – and am in no doubt that this year’s event will be even better. But, sadly, I can’t attend this year because I’ll be on a business trip to a Networked Journalism event in New York but BBC Manchester’s Richard Fair is one of the judges and lots of people have already confirmed their attendance via the Facebook event page. Do try to make it if you can – it should be a lot of fun and is a great opportunity to meet some fellow bloggers.